Odeceixe is a small fishing village 15 km's north of Aljezur. Located in the Natural Park Costa Vincentina. Odeceixe is a beautiful place to spend your holidays. Take a walk through the village and up to the old windmill and you will find its historical charm irresistable. Odeceixe has several restaurants, cafes, bars, supermarket and banks. A three kilometer drive to Odeceixe beach takes you through a fantastic natural river estuary. 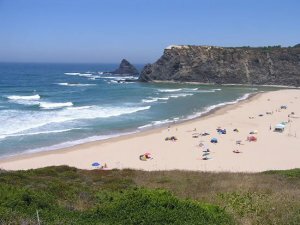 And the beach of Odeceixe itself is perfect for relaxing, for the children and for surfers. There is also a small train transport to and from the town and beach.